You’d be surprised to know that more than 2,400 children are admitted to hospital emergency rooms for electrical shock or burn injuries caused by tampering with a wall outlet (as predicted by the Electrical Safety Foundation) every year. It has been discovered that 70% of these electric shock related accidents occur at home and under adult supervision. Sounds “shocking” right? But that’s what the scenario is like. Your little superstar often tries to fidget with a wall outlet which eventually results in an unpleasant experience we don’t want them to face. While power outlets may have advanced into becoming waterproof, they still aren’t able to differentiate between a plug and a human hand. In spite of living in the world of smart homes which has modified your everyday home accessories starting from a door lock to a mattress, this problem with power outlets still prevail. Or should I say it did prevail until Brio came in the limelight. After their successful Kickstarter project followed by the massive attention they received at the CES 2015, this is inevitably a smart home solution which will make your existing power outlets seem outdated. Good for you, those little hands can now stay safe from unwanted electrocution at home! To put it in one simple sentence, Brio has revolutionized the power outlets and made them safer and smarter at the same time. By using state-of-the-art microelectronics, Brio is able to differentiate between a plug and a human hand which is how it can keep your kids safe from getting electrocuted. The mission is to protect those thousands of families who face such electrical hazards at home every year, most of which occur due to the power outlets. As compared to normal electric outlets which are always on, Brio‘s default state is off. Only when the embedded sensor detects a valid plug and not a finger or knife will the outlet switch to the live 24V “sensing” mode. Even in the sensing mode, Brio will always look for the right level of resistance. In fact, the team behind TechnoBuffalo had tried and “failed” to shock themselves with Brio’s smart outlet. Ha ha! To add to this, there’s the gorgeous beveled design of the outlet which looks cooler than the existing power outlets you’ve had till date. It also includes a cobalt blue LED light for indicating when the outlet is in override mode. But the major attraction of this safe power outlet is the embedded 360-degree home-monitoring system. 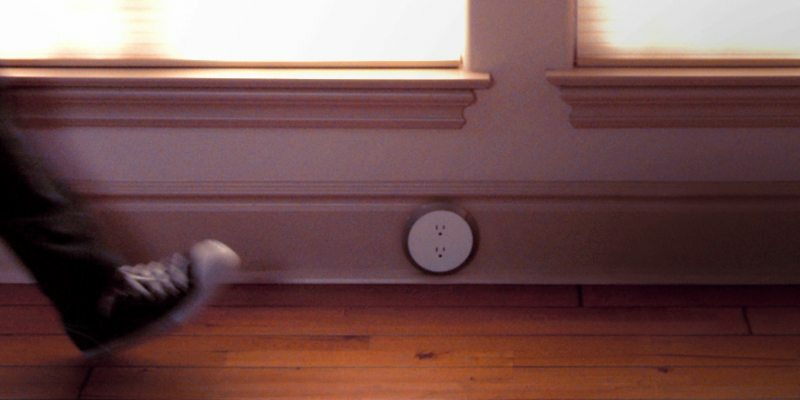 It uses a network of wireless sensors you can place anywhere around the house for detecting potential hazards such as a water leakage, smoke or carbon monoxide leakage. The sensors will send a signal to the Briowall unit once it detects any such leakage which in turn will send a notification on the corresponding mobile app so that you get to take an action immediately. If your phone is off or you don’t respond to the notification, the sensors will alert you with an audio alarm. Just the smart home monitoring system you need to keep your home safe and your immediate environment free from unwanted hazards. Be it a flood from your kitchen sink or a smoke indoors, your Brio home can combat every difficult situation you might face even when you’re not at home. The idea is to live a better and safer life where your home is always alive to any potential hazard that might come in the way. The Brio Smart home is currently available for pre-order at an estimated delivery by Fall 2015. The pre-order price of the Smart wall unit is $79 with the additional wireless home-monitoring network comprising of a Carbon Monoxide Sensor ($39), Smoke Sensor ($29), Water Sensor ($19). The Brio Safe Outlet, on the other hand, is available for pre-order at $39. So pre-order your set now and always keep you and your family safe indoors. Happy Gadgeting!